With 'Lotus' we've captured the essence and beauty of feminine energy: Simple and Elegant, Stunning and Soulful. Embossed on the crystal clear glass is 'Listen to your soul', so be you at work or play, it will always captivate and delight your eye and heart. Lotus comes in stylish packaging: White and Rose Gold, with a beautiful poem and Rumi quote gift card - The perfect present for yourself or another. 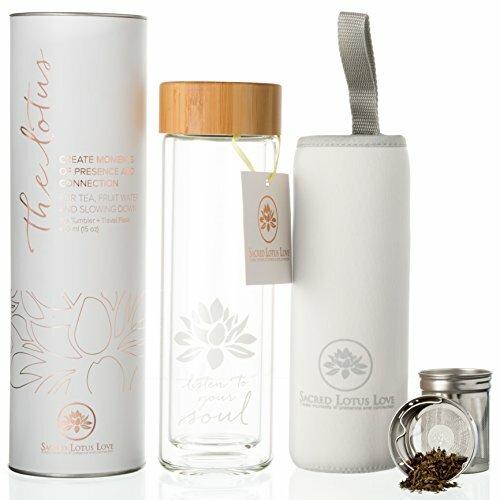 The Double Walled Borosilicate Glass keeps your drinks hot for longer A Stainless Steel Tea Strainer/Infuser Has a Dish-Washable Bamboo lid with Inner BPA Free plastic for a leak proof seal No intrusive marketing on the Tumbler 15 Oz Gift ready with a Poem and Rumi Card delivered in stylish packaging. Simply add your ingredients to the infuser, we recommend Fresh Chopped Ginger and Mint, or place into the body of the bottle. Set the filter in place, and enjoy. Sacred Lotus Love grew from a desire to Create more moments of Presence and Connection in our own lives. We began to notice those precious 'happenings' in our day when we felt centred and calm and set about designing Beautiful, Soulful gifts to facilitate the sharing of those moments with others. We are proud to share Sacred Lotus Love with you. Our promise... Capture the essence of the places, cultures and natures we love in the world. Create stunning, soulful, high-quality gifts, that are easy on the environment. Your end of the bargain... Enjoy more Presence and Connection in your life... and of course, pass it on. After all, what is love if not shared. If you have reason to be unsatisfied with our products we promise a full "100% Guaranteed" refund or replacement. Reach out and let us know how we can help. CREATE MOMENTS OF PRESENCE AND CONNECTION - with the NEW and Improved Version 2 of our signature double walled glass tea tumbler and infuser with REINFORCED GLASS BOTTOM. Perfect for loose leaf tea, fruit infusions, organic coffee, cocoa, or flavored water. Enjoy at home or on the go, work or play. SLIM, LIGHT & STRONG - Each tea bottle is made of lightweight, insulated, durable glass + new stronger bottom. Holds 15 oz. of liquid, has a leak proof lid and features a 'Lotus' flower on both the removable infuser and strainer. Includes a NEW Travel SLEEVE. Luxury and practicality combined. INSPIRE, CONNECT, LOVE - Featuring a subtle, beautiful, logo free 'Lotus' design and mantra to inspire and infuse presence and connection in your day. Live a more soulful, connected and aligned life; healthy for the environment and your body. FEEL GREAT, BE HEALTHY & ECO-FRIENDLY - No harmful plastic, chemical smells, or toxins. Each glass and steel strainer / infusers are tested to the highest standard and are both BPA & Lead FREE. GIFT READY WITH BEAUTIFUL PACKAGING - Each bottle comes gift ready in stunning packaging, beautifully wrapped, and with a unique companion poem & Rumi card inspired by the design. GUARANTEED SATISFACTION - If for any reason you are not happy with your purchase, simply contact us directly and we will refund or replace - your choice! If you have any questions about this product by Sacred Lotus Love, contact us by completing and submitting the form below. If you are looking for a specif part number, please include it with your message.